I had plenty of opportunities to see all stages of warp preparation while I was at Ock Pop Tok for 2 months and during a couple of visits to Vientiane, and I share my images & videos here for those who are interested in these details. To give an overview of a Lao-Tai loom, here is a drawing by Corinne Matesich so you can see how the warp is taken behind the back beam, then up and over the frame of the loom to a bag near the weaver where the very long warp is kept. In this video, the long warp threads are measured out on a warping board. Traditionally this was done around the posts underneath houses. Notice that she has 20 spools of silk thread on a the frame she is carrying so that she can measure 20 ends at a time onto the warping board. I came past again a little later and the warp was in position on the loom, ready to be brought through the heddles and reed, which are sitting in a bundle on the plank seat. A section of the previous warp (white) can be seen knotted in place, and each thread of the new gold warp will be tied to one of these white threads to save time by not having to thread each gold thread correctly through the heddles and reed. The remainder of the warp is stored in a bag visible at the bottom right of the photo. A couple of short pieces of bamboo are in place: one to hold the tensioning knot above the weaver so she can adjust it as she weaves, and another to hold the top of the chained warp. You can see one of these being inserted at the end of the previous video. So many knots in such fine silk! The new white weft ends have been tied to the old black weft ends. At the lower left, you can see the thicker nylon yarn of the heddles. 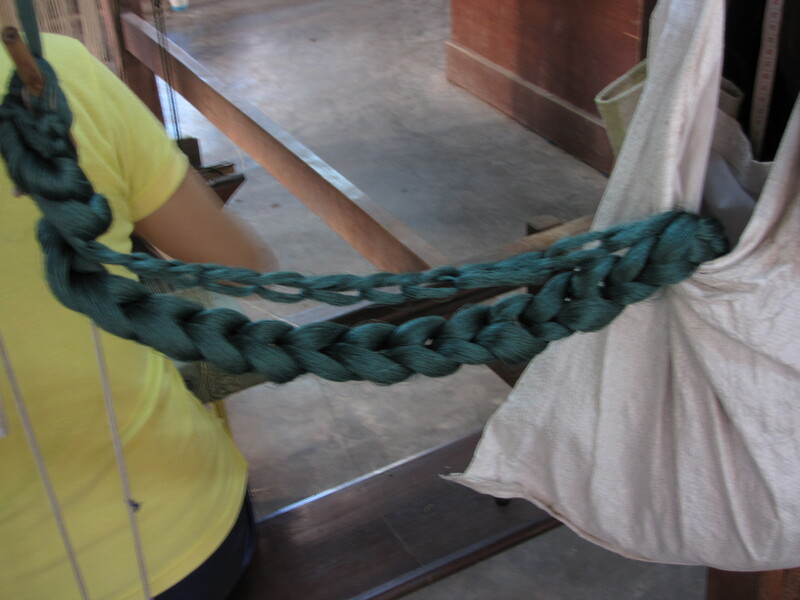 See how the supplementary weft patterns are created in Lao weaving at Chok & Kit. This entry was posted in Lao Techniques and tagged Asia, Laos, loom, silk, Tai, Textile, traditional, warp, weaving by Wendy Garrity. Bookmark the permalink.